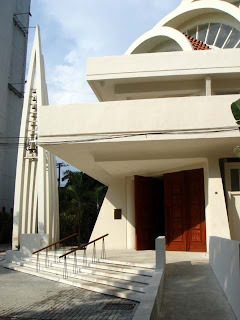 The Parish Church of St. Alphonsus was built in 1968 and consumed by fire in September 2004. We are rebuilding the church, preserving the concrete structure that survived the fire while adding a soaring roof that increases the height from six meters to 28 meters. With a new mezzanine, seating will also increase from 300 to 900. The new structure will be a symbol of a community transforming tragedy into grace. 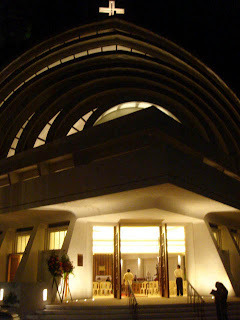 In 1968, Architect Leandro Locsin designed an 800-square-meter parish church that was intimate and low, with an interior that was dark. 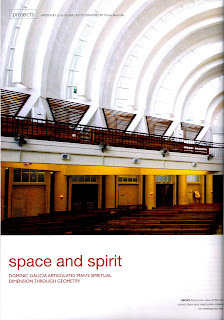 The plan was a perfect square, 28 meters each side, with a four-meter-high ceiling that was flat. The central aisle ran along the diagonal of the square. Marching along the perimeter were 28 concrete buttresses four meters tall, which were wide at the base and narrow at the top. They seemed to support a massive roof slab, which was actually a tall parapet wall that shielded the corrugated metal roof. 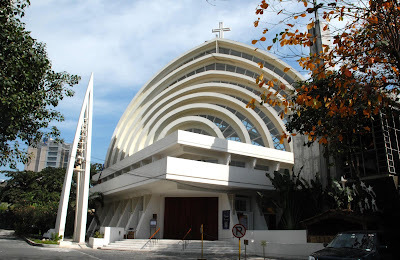 Thirty-five years later, it was one of the busiest churches in Metro-Manila. A 22-story college building had risen to dwarf it. Beside it, a country road had become a two-level highway. Makati had become the country's financial capital. When fire destroyed the building, only the 28 buttresses remained. After much deliberation, the parish decided that it would be more economical and symbolically pithy to salvage the buttresses, rather than demolish them and start from scratch. The new structure will consist of 13 roof vaults resting on new composite columns. The central roof vault, eight meters wide, will travel the longest distance, which is the diagonal of the square plan, to a height of 28 meters. 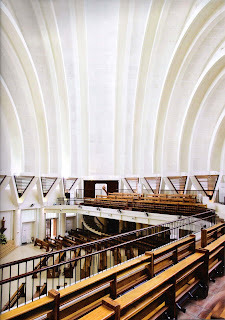 Independent roof vaults, 4 1/2 meters wide, will ascend to it on either side, beginning at 11 meters from ground level, then 14 meters, 16 meters, 18 meters, 21 meters, and 25 meters, like the 12 apostles who accompanied Jesus Christ. The vaults will be thin-shell concrete membranes clad in unglazed clay tiles, which will help reduce heat gain. The vaults are separated by clear glass windows, which, in the upper reaches of the building, are also operable. 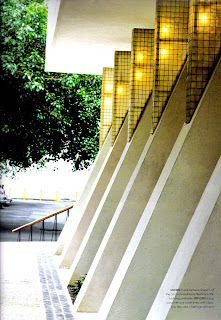 The 28 buttresses, originally designed for aesthetic effect, were hollow. They will now be filled with concrete to fulfill a new structural purpose of providing lateral support to the new composite columns that carry the roof vaults. The goal, ostensibly, is a sustainable building that by its architecture minimizes its waste of materials and dependence on fossil fuels. 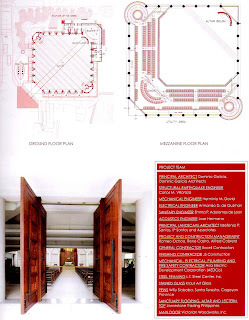 The project will also serve to sustain things other than tangible material resources: Memory and Faith. The most important thing that we are doing here is to reuse the existing structure as the springboard for our soaring roofs. The existing structure will serve as an agent of Memory, a reminder of the many events that the community celebrated in it, as well as a reminder that the community survived a tragedy together. 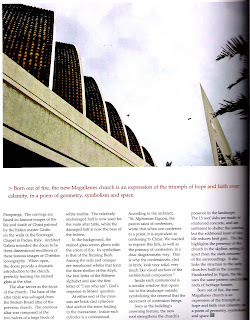 It is as a phoenix rising that the structure will serve as an agent of Faith. 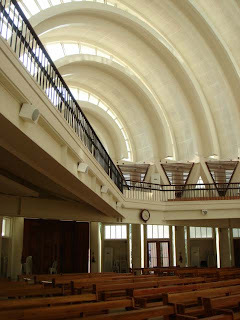 The symbolism is multivalent and instructive, demonstrating tenets of the Catholic faith: the original structure speaks of mortality, suffering, death; the soaring new space speaks of paradise, grace, and resurrection. 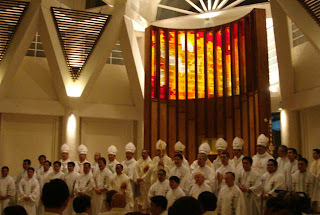 The Altar Wall acts as the backdrop of the Sanctuary. It is about 6.8 meters tall and curved in plan, but if one were to stretch it out, it would be almost four and a half meters wide. 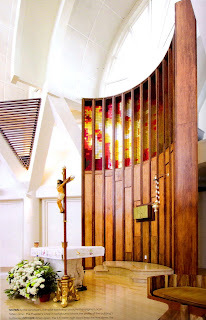 The upper part of the wall is stained glass, and the lower part is wood-clad concrete. 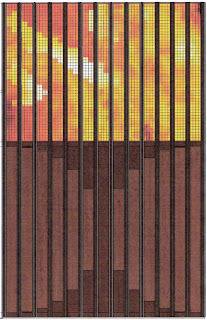 The colors of the stained glass – there are six (white, yellow, yellow orange, orange, red orange, and red) – are distributed in 50 cm by 50 cm squares of stained glass, creating the vibrant blaze of the Burning Bush. White is used only in the three strokes that comprise the Hebrew letter called the Aleph, which is the first letter of the unutterable name of God. The sun rises directly behind the stained glass. 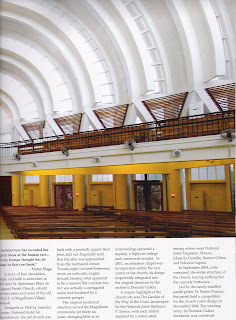 Article on Magallanes Church as seen in April 2009 issue of BluPrint Magazine. Please right-click an image to enlarge and read the text. St. Alphonsus once wrote that when one confesses to a priest, it is equivalent to confessing to Christ himself. 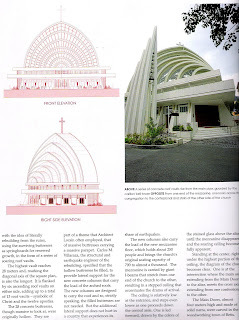 This is why the confessionals in Magallanes Church are built as two equal cylinders, massive brick drums that visually support either end of the main roof vault. 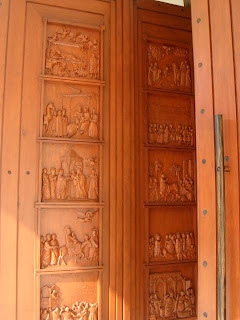 They are architectural expressions of St. Alphonsus' equivalency of confessing to a priest and confessing to Christ. There is also an inner drum, concentric with the brick drum. This inner drum, as originally designed, is a deep and narrow well where the penitent enters and kneels. 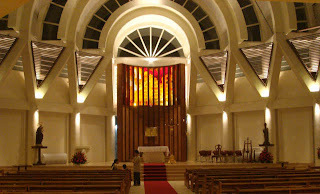 It is an architectural expression of the depth of sin that a penitent may feel himself to be in, and deep within this depth he kneels to confess. 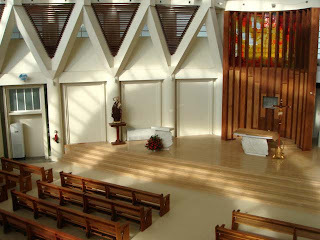 He looks through the confessional screen that separates him from the priest, past the silhouette of the priest's profile, and towards a large circular window that frames the view of a garden beyond. 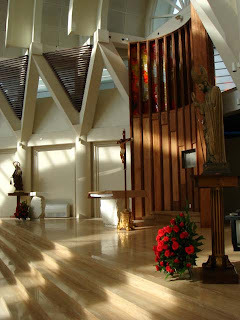 This is an architectural expression of the saving power of confession, of the paradise that awaits one if one confesses, even from the deepest depths of sin. 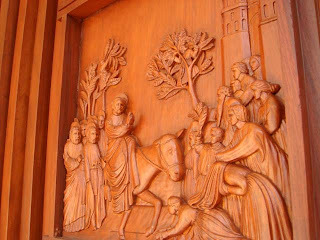 Thus is St. Alphonsus' championing of confession expressed in architectural terms, and in varying scales, from the physical composition of the church building to the inner, spiritual landscape of the penitent's experience.